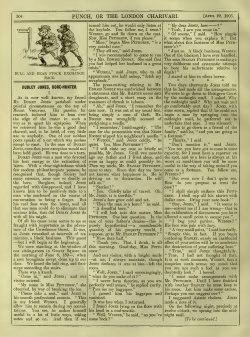 Dudley Jones, Bore-Hunter is a Sherlock Holmes parody written by P. G. Wodehouse published in Punch on 29 april and 6 may 1903. The story was published anonymously but credited to Wodehouse in the Index to Vol. 124 of Punch. As is now well known, my friend Mr. Dudley Jones perished under painful circumstances on the top of Mount Vesuvius. His passion for research induced him to lean over the edge of the crater in such a way as to upset his equipoise. When we retrieved him he was a good deal charred, and, to be brief, of very little use to anybody. One of our noblest poets speaks of a cat which was useless except to roast. In the case of Dudley Jones, even that poor exception would not have held good. He was done to a turn. Dudley Jones was a man who devoted his best energy to the extinction of bores. With a clear-sightedness which few modern philanthropists possess, he recognised that, though Society had many enemies, none was so deadly as the bore. Burglars, indeed, Jones regarded with disapproval, and I have known him to be positively rude to a man who confessed in the course of conversation to being a forger. But his real foes were the bores, and all that one man could do to eliminate that noxious tribe, that did Dudley Jones do with all his might. Of all his cases none seems to me so fraught with importance as the adventure of the Unwelcome Guest. It was, as Jones remarked at intervals of ten minutes, a black business. This guest—but I will begin at the beginning. We were standing at the window of our sitting-room in Grocer Square on the morning of June 8, 189—, when a new brougham swept clean up to our door. We heard the bell ring, and footsteps ascending the stairs. "Come in," said Jones; and our visitor entered. "My name is Miss Pettigrew," she observed, by way of breaking the ice. "Please take a seat," said Jones in his smooth professional accents. "This is my friend Wuddus. I generally allow him to remain during my consultations. You see, he makes himself useful in a lot of little ways, taking notes and so on. And then, if we turned him out, he would only listen at the keyhole. You follow me, I trust? Wuddus, go and lie down on the mat. Now, Miss Pettigrew, if you please." "Mine," began Miss Pettigrew, "is a very painful case." "They all are," said Jones. "I was recommended to come to you by a Mrs. Edward Noodle. She said that you had helped her husband in a great crisis. "Wuddus," said Jones, who to all appearances was half asleep, "fetch my scrapbook." 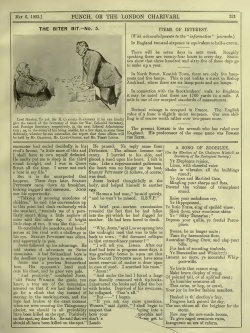 The press-cutting relating to Mr. Edward Noodle was sandwiched between a statement that Mr. Balfour never eats doughnuts, and a short essay on the treatment of thrush in infants. "Ah," said Jones, "I remember the case now. It was out of my usual line, being simply a case of theft. Mr. Noodle was wrongfully accused of purloining a needle." "I remember," I said eagerly. "The case for the prosecution was that Neddy Noodle nipped his neighbour's needle." "Wuddus," said Jones coldly, "be quiet. Yes, Miss Pettigrew?" "I will state my case as briefly as possible, Mr. Jones. Until two months ago my father and I lived alone, and were as happy as could possibly be. Then my uncle, Mr. Stanley Pettigrew, came to stay. Since that day we have not known what happiness is. He is driving us to distraction. He will talk so." "Yes. Chiefly tales of travel. Oh, Mr. Jones, it is terrible." Jones's face grew cold and set. "Then the man is a bore?" he said. "I will look into this matter, Miss Pettigrew. One last question. In the case of your father's demise — this is purely hypothetical — a considerable quantity of his property would, I suppose, go to Mr. Stanley Pettigrew?" "Thank you. That, I think, is all this morning. Good-day, Miss Pettigrew." And our visitor, with a bright smile — at me, I always maintain, though Jones declares it was at him — left the room. "Well, Jones," I said encouragingly, "what do you make of it?" "I never form theories, as you are perfectly well aware," he replied curtly. "Pass me my bagpipes." I passed him his bagpipes and vanished. It was late when I returned. I found Jones lying on the floor with his head in a coal-scuttle. "Well, Wuddus," he said, "so you've come back?" "Tush, I saw you come in." "Of course," I said. "How simple it seems when you explain it! But what about this business of Miss Pettigrew's?" "Just so. A black business, Wuddus. One of the blackest I have ever handled. The man Stanley Pettigrew is making a very deliberate and systematic attempt to bore his unfortunate relative to death!" I stared at him in silent horror. Two days afterwards Jones told me that he had made all the arrangements. We were to go down to Pettigrew Court by the midnight mail. I asked, Why the midnight mail? Why not wait and go comfortably next day? Jones, with some scorn, replied that if he could not begin a case by springing into the midnight mail, he preferred not to undertake that case. I was silenced. "I am to go down as a friend of the family," said he, "and you are going as a footman." "Don't mention it," said Jones. "You see, you have got to come in some capacity, for I must have a reporter on the spot, and as a bore is always at his worst at meal-times you will be more useful in the way of taking notes if you come as a footman. You follow me, Wuddus?" "But even now I don't quite see. How do you propose to treat the case?" "I shall simply outbore this Pettigrew. I shall cap all his stories with duller ones. Bring your note-book." "Stay, Jones," I said. "It seems to me — correct me if I am wrong — that in the exhilaration of the moment you have allowed a small point to escape you." "I beg your pardon, Wuddus?" His face was pale with fury. "A very small point," I said hurriedly. "Simply this, in fact. If you begin outboring Stanley, surely an incidental effect of your action will be to accelerate the destruction of your suffering host." "True," said Jones thoughtfully. "True. I had not thought of that. It is at such moments, Wuddus, that a suspicion steals across my mind that you are not such a fool as you undoubtedly look." I bowed. "I must make arrangements with Mr. Pettigrew. Until I have finished with brother Stanley he must keep to his room. Let him make some excuse. Perhaps you can suggest one?" I suggested Asiatic cholera. Jones made a note of it. On the following night, precisely at twelve o'clock, we sprang into the midnight mail. I think Stanley Pettigrew had his suspicions from the first that all was not thoroughly above board with regard to Jones. Personally, I think it was owing to the latter's disguise. It was one of Jones's foibles never to undertake a case without assuming a complete disguise. There was rarely any necessity for a disguise, but he always assumed one. In reply to a question of mine on the subject he had once replied that there was a sportsmanlike way of doing things, and an unsportsmanlike way. And we had to let it go at that. On the present occasion he appeared in a bright check suit, a "property" bald head, fringed with short scarlet curls (to match his tie and shirt), and a large pasteboard nose, turned up at the end and painted crimson. Add to this that he elected to speak in the high falsetto of a child of four, and it is scarcely to be wondered at that a man of Stanley's almost diabolical shrewdness should suspect that there was something peculiar about him. As regarded my appearance Jones never troubled very much. Except that he insisted on my wearing long yellow side-whiskers, he left my make-up very much to my own individual taste. I shall never forget dinner on the first night after our arrival. I was standing at the sideboard, trying to draw a cork (which subsequently came out of its own accord, and broke three glasses and part of the butler), when I heard Jones ask Stanley Pettigrew to think of a number. His adversary turned pale, and a gleam of suspicion appeared in his eye. "Double it," went on Jones relentlessly. "Have you doubled it?" "Yes," growled the baffled wretch. "Add two. Take away the number you first thought of. Double it. Add three. Divide half the first number (minus eighteen) by four. Subtract seven. Multiply by three hundred and sixteen, and the result is the number you first thought of minus four hundred and five." "Really?" said Stanley Pettigrew with assumed indifference. "My dear Jones, how——?" I began admiringly. Jones flashed a warning glance at me. Miss Pettigrew saved the situation with magnificent tact. "John," she said, "you forget yourself. Leave the room." I was therefore deprived of the pleasure of witnessing the subsequent struggles which, to judge from the account Jones gave me in my room afterwards, must have been magnificent. "After the fish," said Jones, "he began—as I had suspected that he would—to tell dog-stories. For once, however, he had found his match. My habit of going out at odd moments during the day to see men about dogs has rendered me peculiarly fitted to cope with that type of attack. I had it all my own way. Miss Pettigrew, poor girl, fainted after about twenty minutes of it, and had to be carried out. I foresee that this will be a rapid affair, Wuddus." But it was not. On the contrary, after the first shock of meeting a powerful rival so unexpectedly, Stanley Pettigrew began to hold his own, and soon to have the better of it. "I tell you what it is, Wuddus," said Jones to me one night, after a fierce encounter had ended decidedly in his rival's favour, "a little more of this and I shall have to own myself defeated. He nearly put me to sleep in the third round to-night, and I was in Queer Street all the time. I never met such a bore in my life." But it is the unexpected that happens. Three days later, Stanley Pettigrew came down to breakfast, looking haggard and careworn. Jones saw his opportunity. "Talking of amusing anecdotes of children," he said (the conversation up to this point had dealt exclusively with the weather), "reminds me of a peculiarly smart thing a little nephew of mine said the other day. A bright little chap of two. It was like this——"
He concluded the anecdote, and looked across at his rival with a challenge in his eye. Stanley Pettigrew was silent, and apparently in pain. Jones followed up his advantage. He told stories of adventure on Swiss mountains. A bad Switzerland bore is the deadliest type known to scientists. Jones was a peerless Switzerland bore. His opponent's head sank onto his chest, and he grew very pale. "And positively," concluded Jones, "old Franz Wilhelm, the guide, you know, a true son of the mountains, assured us that if we had decided to go for a climb that day instead of staying in the smoking-room, and the rope had broken at the exact moment when we were crossing the Thingummy glacier, we should in all probability have been killed on the spot. Positively on the spot, my dear Sir. He said that we should all have been killed on the spot." He paused. No reply came from Pettigrew. The silence became uncanny. I hurried to his side, and placed a hand upon his heart. I felt in vain. Like a superannuated policeman, the heart was no longer on its beat. Stanley Pettigrew (it follows, of course) was dead. Jones looked thoughtfully at the body, and helped himself to another egg. "He was a bad man," he said quietly, "and he won't be missed. R.S.V.P." A brief post-mortem examination revealed the fact that he had fallen into the pit which he had digged for another. He had been bored to death. "Why, Jones," said I, as we sprang into the midnight mail that was to take us back to town, "did deceased collapse in that extraordinary manner?" "I will tell you. Listen. After our duel had been in progress some days, it was gradually borne in upon me that this Stanley Pettigrew must have some secret reservoir of matter to draw upon in case of need. I searched his room." "And under the bed I found a large case literally crammed with tip-books. I abstracted the books and filled the box with bricks. Deprived of his resources, he collapsed. That's all." "If you ask any more questions, Wuddus," said Jones, "I shall begin to suspect that you are developing into a bore yourself. Pass the morphia and don't say another word till we get to London."